This week’s record is very dear to me for two important reasons. 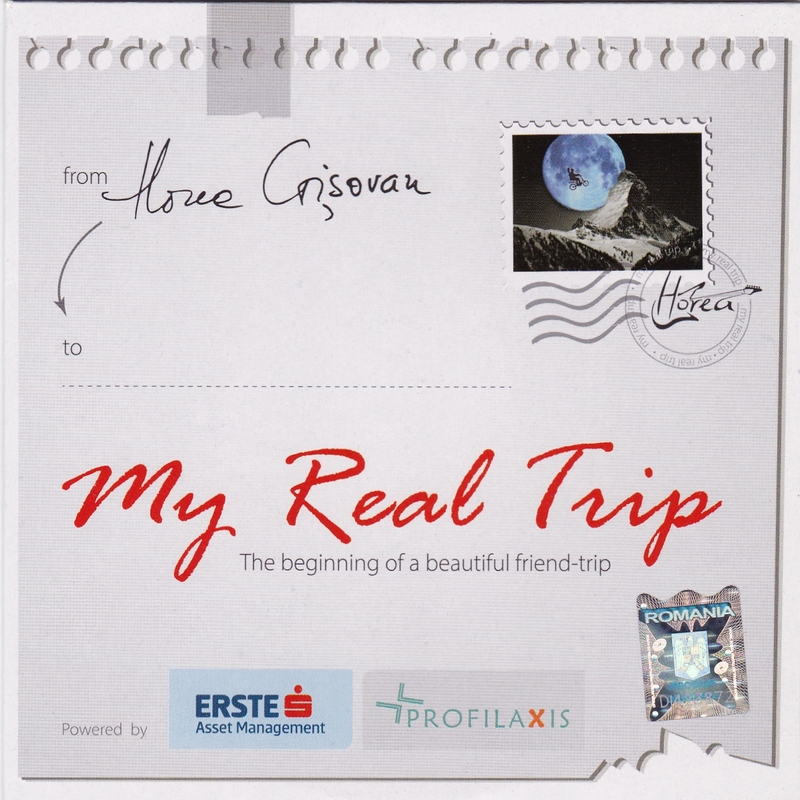 First, because I’ve followed the career of veteran guitarist Horea Crișovan for over a decade, during which time I anxiously awaited his first solo endeavor. Second, because it is a work I’ve had the opportunity to watch grow from primary recording stages to finished product. After my recent interview with Horea, where he told me that he was preparing a collection of entirely acoustic compositions, we’ve kept in touch and he has sent me the “first drafts” of various tracks as he got around to recording them. In a way, I am biased when it comes to My Real Trip, mainly because I was a fan of this album before it even existed. Throughout the years, fans have had the opportunity to enjoy this versatile musician’s work in numerous bands spanning various genres. While his technique has always been impeccable and his activity as sideman and band-member offered generous views into the depths of his talent, it always felt like the full extent of his potential was only rarely glimpsed. On My Real Trip, Horea gets to showcase music that is entirely his own, undiluted and uncontaminated by outside influences. The record was composed and recorded entirely by the musician (in his self-built sound-box in the middle of his living room), then sent to sound technician Adrian Popescu in Paris, who took over the mixing and engineering aspect (by the way, kudos to him because the sound is absolutely fantastic). In that respect, this album is a rare occurrence. The record begins with a song called “Intro Classic”, an appropriate opener because it encapsulates all the key elements of Horea’s compositions: the admirable technique, sublime musicality and most importantly, the narrative. “Enlight” follows in the same vein. Both are simple, straightforward tracks shaped in what I like to call “the a-b-a design”, where b is a lively, fast-paced middle-fragment framed by two delicate theme-based sections (a) which create a sort of introduction and conclusion to b. This only serves to strengthen the aforementioned narrative. In fact, when Horea sent me the tracks in their early stages of development I suggested a certain track placement in order to produce what I thought was the most coherent sequential flow (a writer’s habit). Fortunately, he did not take my advice and, instead, drew up a much better track placement which makes even more sense from a storytelling perspective. The first two tracks are clean and tame, creating an identity for the sound of the album, after which the songs start branching out into more diverse themes and structures. The third song is “Times Passing By”, my personal favorite. It is a restrained and candid piece with a bit of a Spanish vibe whose brilliance lies in its profound subtlety and emotional expressiveness. It might not instantly stand out like “Bossa Rossa”, “Dance” or “Marco Polo”, but repeated listening reveals a very delicate work which manages the difficult task of being very sentimental while also remaining cerebral. Speaking of “Bossa Rossa”, it follows “Times Passing By” and further diversifies the musical landscape with some catchy bossa nova, leading into a formation of four powerful songs which form the core of the record, both in track-placement and symbolism. The lyrical dynamic is dominated by two powerful themes: “My Real Trip” and “Mecanisme” (Mechanisms), which are preceded by “Dans” (Dance) and “Dream” respectively. The duality of these songs, expressed through their rural-charm-versus-urban-anxiety motif, forms the core of this album’s story. “My Real Trip” is introduced by “Dans”, with its fast-paced balkan-inspired rhythm developing into the slow, somewhat folk-sounding “trip” which evokes images of travel and country scenery. According to Horea, it’s a musical theme that has been haunting him for a long time. The balance is created with the somber, brooding pair of “Dream” connected with “Mecanisme”, its sound-effects of beating clocks counterbalancing the natural, sacred charm of the aforementioned songs with visions of a synthetic, profane landscape. The story’s character awakens from a wonderful dream of freedom and bliss to find himself back in his consuming urban environment. The way in which this particular portion of the record is established and elaborated is nothing short of genius and will be as haunting to the listeners as it no-doubt is to the musician. “Rain Still Falling” and “Nameless Song” continue with a lighter atmosphere, dispersing some of the tension from the previous “chapters” of this musical travel journal. If I’m not mistaken, “Rain Still Falling” is an older composition which I think I’ve heard before in one of his acoustic gigs. For me, it gave the record a nice touch of familiarity and continuity. “Marco Polo” is another outstanding track, and the only one which features another musician, Leb i sol guitar-great Vlatko Stefanovski. I have to admit that at first I wasn’t thrilled about the collaboration, if only because this is such an intensely personal project for Horea that I felt any outside interference (be it Vlatko, Dominique DiPiazza or even Mark Knopfler) would feel like an intrusion and take away from the personal relationship between the listener’s ears and Horea’s mind. However, the Macedonian virtuoso supplies an outstanding contribution that never once feels out of place or takes away from the aura of intimacy that envelops the songs. Far from being invasive, it helps paint a wonderful picture of the artistic relationship and profound respect between two musicians. “Epilog” (Epilogue) does not, in fact, close the record. It is as if the artist felt that the song was too dark and restive and did not want the listener to feel burdened. Indeed, while it is an amazing composition which takes me back to Marc Ribot’s Silent Movies, it does not reflect the character of the musician like “Forrest Song”, in which the nature-loving guitarist predictably retreats into the woods, where the soul is at ease and the mind is free. This is the true epilogue to the story of this “trip”, a song with a powerfully anecdotal character, reminiscent of Mark Knopfler’s latest compositions (which is not a comparison I make lightly since I’ve been worshipping Knopfler ever since my teens). Thus, the final chapter is warm and lighthearted, accurately reflecting the musician’s personality. All in all, while the music is very accessible for all audiences, My Real Trip is first and foremost a purist’s record. It is a work which demands complete focus. The message is powerful, but it is whispered, not shouted. Take your time with this one. Isolate yourself from everything but this amazing music. It will then reveal subtle nuances you would have never known were there if you had just relegated it to background- or car-music. Horea Crișovan’s long-awaited debut is a heartfelt expression of love for the medium. The musician invites you into his own personal space and you truly feel like you are a part of his compositional universe. With this record, Crișovan proves that he is not only an admirably gifted guitar player but also a world-class composer whose rightful place is in the upper echelon of the international quality music scene. Thanks for the wonderful review and the You Tube link. I can’t find the album (or anything by him) on Amazon or iTunes though. What to do? He’ll certainly be able to help out in this matter.